The Sinsinawa Dominican Congregation welcomed Sisters Nicole Reich and Quincy Howard as they made their first profession of vows at Mass Sunday, July 30, 2017. From left: Sister Nicole, Sister Mary Ann Nelson, Prioress Toni Harris, and Sister Quincy. “I’m happy to be coming in as a full member now,” Sister Nicole said. At the recent golden jubilarian celebration, she noted how all the professed sisters in the congregation stood to renew their vows, an annual tradition of the congregation. The other sisters were smiling at her and saying, “Next year.” “I’m looking forward to that,” she added. Sisters Nicole Reich (front) and Quincy Howard make their first profession of vows with the Sinsinawa Dominican Congregation at Mass Sunday, July 30, 2017. While Sister Quincy had long-standing connections with the Sinsinawa Dominicans, Sister Nicole’s were more recent. She had reached a point of transition in her life while living in Dubuque. Sister Carol Hoverman, a Dubuque Franciscan, had been inviting Sister Nicole to participate in some of their activities and celebrations. Sister Nicole said, “She must have seen something in me that I didn’t.” But, as Sister Nicole notes, Sister Carol was subtle. Sinsinawa Dominican Sister Rosanna Gleason, OP, also knew Sister Nicole. She inquired, “So what are you doing with your life?” “Looking for a job,” was Sister Nicole’s reply. “I might have something,” Sister Rosanna offered. As things turned out, Sister Nicole began working as a family caregiver with sisters in Siena Assisted Living area of the motherhouse at Sinsinawa Mound. “Grace was there,” said Sister Nicole. She worked with the sisters for three years before making her formal entry into the congregation. Sister Nicole laughs as she reminisces about the hints and questions she would get from the sisters. They would say, “You’re single,” and then ask, “Are you Catholic?” Another female employee was getting fixed up with a sister’s great-nephew. Nicole noticed she was not. “We have other plans for you,” she was told. At one point, Sister Frances Therese Murray, OP (1914-2016), straightforwardly asked her, “So when are you going to take the habit?” “The Sinsinawa Dominicans were not subtle!” Sister Nicole laughed. Nevertheless, she kept her discernment quiet so as not to have the focus on her but on her work. She also attended a Dubuque’s Got Sisters weekend to learn more about the area congregations of women religious. The two sisters have prepared for taking their temporary vows through a year of candidacy and two years of novitiate. 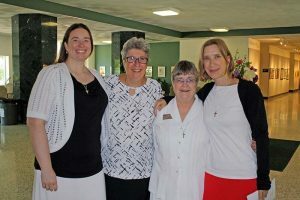 Each lived in community with a group of Sinsinawa Dominican sisters and participated in study and ministry during their first year of formation as a candidate. Their second year was spent at the Collaborative Dominican Novitiate in St. Louis as canonical novices. They learned about the Dominican Order, took classes, and volunteered in the community. Sister Quincy spent her second year of the novitiate in Denver where she lived with sisters and took classes at Iliff School of Theology. Sister Nicole lived with sisters in Chicago and studied at Loyola Institute for Pastoral Studies, working on her master’s degree in pastoral studies with an emphasis on health care chaplaincy. Profession brings the next step in their formation as well as deep gratitude. Sister Nicole will complete her degree before moving into a new ministry. Sister Quincy moved to the Washington, D.C., area to minister as a fellow with NETWORK Lobby. 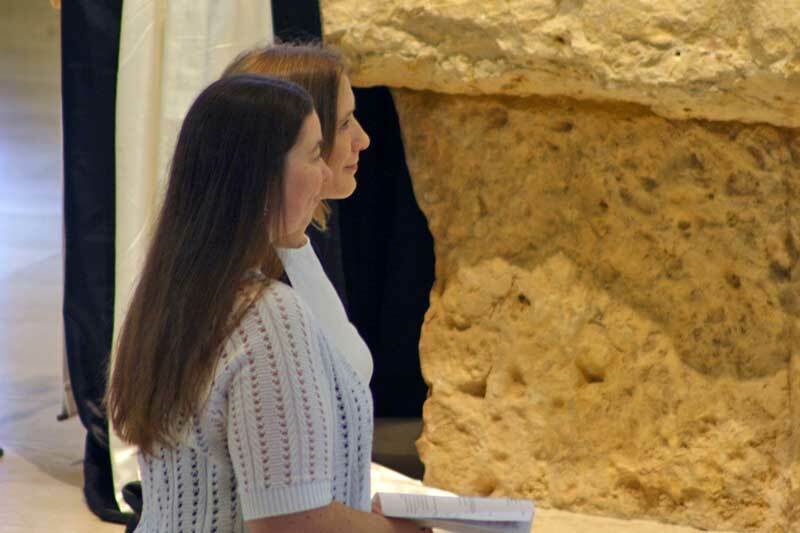 Both are grateful for the support they have received from their families and friends, the Sinsinawa Dominican sisters, and others in religious life. Sister Quincy’s life as a child in the Diocese of Tyler, Texas, with her parents JoAnne Cusack Howard and David C. Howard (both deceased) began the journey she continues to unfold. Sister Nicole carries with her the foundation she received in Janesville, Wis., attending St. William Parish and School and from her parents, Rick and Mary (Nettesheim) Reich of Dubuque. Please hold them in prayer as they begin their life as vowed religious.